Enzymes are one of the most important protein molecules that are required by our body to work properly. Enzymes are used in various chemical reactions that happen inside our body and the cell. Let’s discuss the enzymes in more detail. Enzymes are the molecules which help chemical reaction in the body, and inside of the cell by speeding them up. They are the type of proteins which are made of amino acid strings. The sequence of amino acid strings distinguish one enzyme from others and also their function. The main processes of the body in which enzymes take part are digesting food, respiration, and nerve function, and in muscles. Actually, these are just a few processes, but enzymes take part in almost every chemical reaction in the body. Enzymes have specific structures on their surface, called active site. These active sites can only attach and react with specific molecules that the enzyme can react with. The molecule which reacts with an enzyme is called a substrate, and the molecule which an enzyme release is called product. Gathering on the same area – In this step, the substrate and enzyme are gathered in the same area to start the reaction. 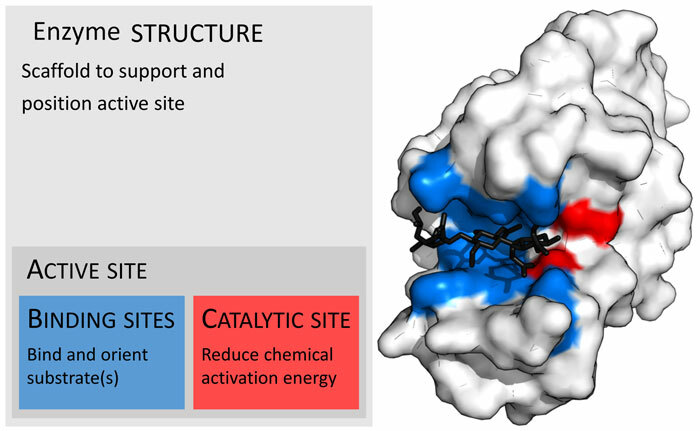 Grabbing onto a substrate – The reaction between enzyme and substrate will happen at active sites. The combination of the substrate with the active site of the enzyme is also called the enzyme/substrate complex. Every type of enzyme can only grab the substrate with which it can react because active sites of enzymes have only the shape of its reacting substrates. Catalysis – In this step, enzymes act on substrates and change it. The change may be the production of a new molecule by combing two molecules together, or it can be the breaking of a molecule into two molecules. After catalysis, the substrate is converted into product and the combination is called an enzyme/product complex. Releasing the product – When the product is ready, the enzyme will release it and will recover its own shape. After the shape recovery, the enzyme is again ready to act on another substrate. The enzymes are never consumed in the process of catalysis. Oxidoreductases – This types of enzymes only catalyze oxidation/reduction (redox) chemical reaction. Transferases – These enzymes have the job of transferring functional groups (e.g. methyl group) from one molecule to another during catalysis. Transferring of functional groups is one of the most vital chemical reactions that happen in the body. Hydrolases – These enzymes break the bonds of molecules by adding water to them. The process is also called hydrolysis. Lyases – These enzymes perform the chemical reaction, called lysis, in which double bonds are formed. Isomerases – These types of enzymes form a product from a substrate by bringing some structural changes in it – which are also called isomerization changes. Ligases – These enzymes bond two substrates together with chemical bonds. The reaction is also called ligation. Catalysts are the substance which helps the chemical reaction by speeding them up, but they are not consumed themselves in the reaction. The action of the enzymes and their ability to speed up the reaction can be reduced or stopped by adding inhibitors. Our mouth contains saliva which has specific enzymes that help in breaking down starches in the food we chew. Abdul Wahab, "Enzymes," in Science4Fun, April 12, 2019, http://science4fun.info/enzymes/.